Plan on doing visa runs Pattaya to Laos? That's what I did and I had a fun. Not only did I get to enjoy Lao beer for 8000 kip (US$1) but I came back to Pattaya stress-free! Unfortunatly many expats who do that visa run come back disappointed. Visa Runs Pattaya to Laos, Vientiene. Although this page is about Visas from the embassy in Vientiane - You can apply it no matter where you're coming from. Take a look at the first picture of the double entry tourist visa from Laos. 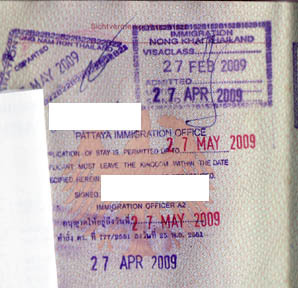 Below that, you see a visa extensions issued by the local Immigration in Pattaya, Jomtien Soi 5. The visa was issued on 23rd of February 2009 and has to be used before 22nd of May. The person holding this visa entered Thailand on 27th February. 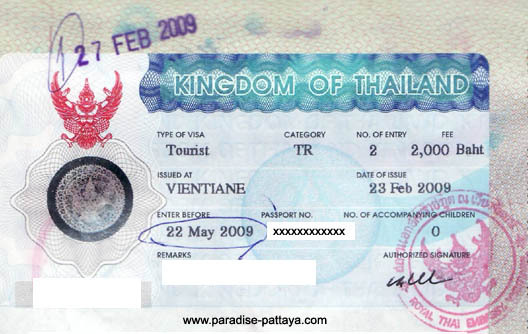 Upon entry to Thailand the visa got stamped February 27th and allowed the visa holder to stay until April 27th 2009 (60 days). Said person went to Jomtien Pattaya on April 27th to the local Immigration office in Jomtien, Pattaya and got a 30 day visa extension (until May 27th) for 1900 Baht. On the 27th of May this person left Thailand on a visa run to the Cambodian border, thinking that He will receive another 60 days which can be extended 30 days again in Pattaya. This happens quite often and that's why I bring this up. The visa itself was only valid until the 22nd of May. The extension has nothing to do with the validity of the visa, which means the visa was expired. This person only got 14 days upon re-entry to Thailand. I talked to someone who works for a visa run company in Pattaya and he told me that he sees this happening all the time. Discover the cheapest way to do the Pattaya Laos Visa Run.